Park at Union Station. Parking is available in the Gateway Center Garage located under the Patsaouras Transit Plaza. The entrance is on Vignes Street. The daily rate is $6, with a 30-day limit. Payment is accepted using cash and major credit cards (Visa, MasterCard, and American Express). The parking garage is patrolled regularly by security officers making it the safest place to park in the area. You can either walk from Union Station (5 blocks) or ride the Metro Gold Line North ($1.50) one stop from Union Station to the China Town Station. The entrance to the event is approximately 100 yards from the China Town Station. Per parks request, security will be searching bags before you can buy your ticket and enter the event. Please do not bring with you Illegal Drugs, Alcohol, Weapons, Explosives, Markers, Spray Paint, and GLOW STICKS. Feathers boas (and items similar) that tend to shed, are discouraged. This is a Leave No Trace Event! We encourage Radical Self Reliance, Radical Self Expression, and Radical Inclusivity! We present to LA a Gifting economy that encourages Decommodification! Our Civic Responsibility and Communal Effort nourish active Participation by all attendees! 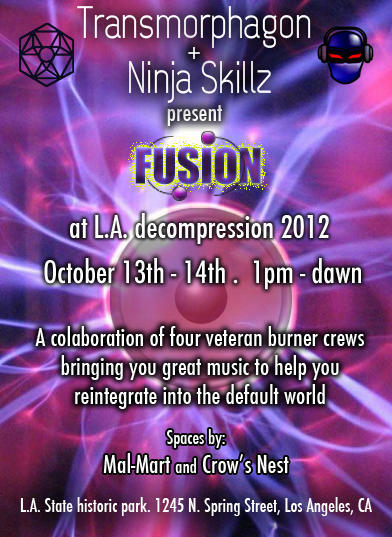 Become a part of the beauty and culture that is LA BM Decompression!